Crowds have flocked to Trafalgar Square to watch the fairytale of the Sultan's Elephant on day three of a four-day street theatre spectacle. 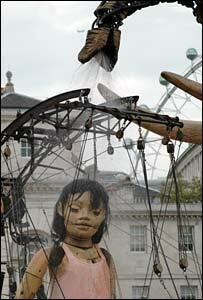 Londoners brushed cynicism aside to see the story play out between a mechanical elephant, the height of a three-storey house, and a huge puppet girl. As the odd couple paraded through London, the elephant chomped on leaves to the delight of children and adults. Several roads were closed and visitors were advised to take public transport. 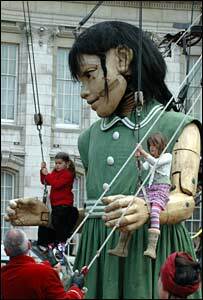 The girl puppet spent last night asleep in a giant deckchair in Horse Guard's Parade, with passers-by able to hearing her snoring. When she awoke, the 42-tonne giant elephant, made of hundreds of moving parts, showered her in water before she changed out of her nightie and into a green dress. They then paraded through the streets of London and spent the afternoon dozing in Trafalgar Square watched by thousands of people despite the rain. By 1815 BST they are due back at Horse Guard's Parade for bedtime music before falling asleep at 2000 BST. The event is being funded mainly by Arts Council England and the London Development Agency. Police advised motorists not to use the routes around Trafalgar Square, Piccadilly and Regent Street over the weekend and expect some closures in The Mall and Horse Guard's Road.